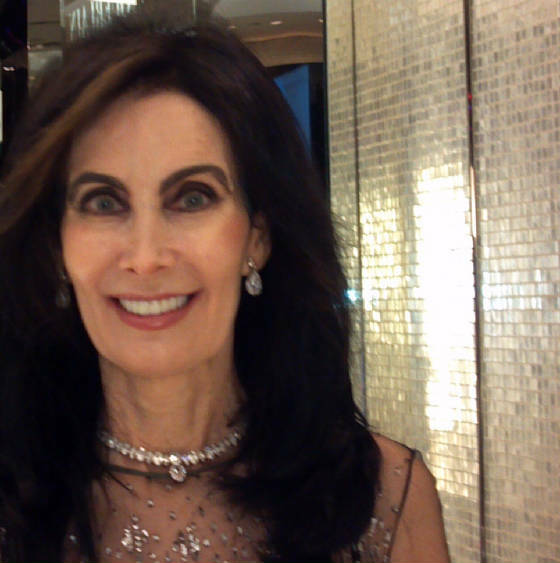 Joanna Cutler is widely recognized as one of New York's most successful real estate brokers. She is constantly praised by clients and customers for her exemplary service and extraordinary results. Joanna possesses an encyclopedia-like knowledge of New York real estate. 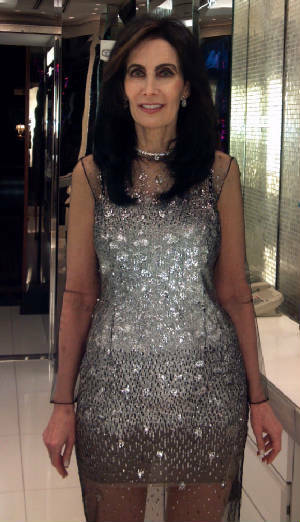 She has been a specialist in high-end properties for over twenty five years. 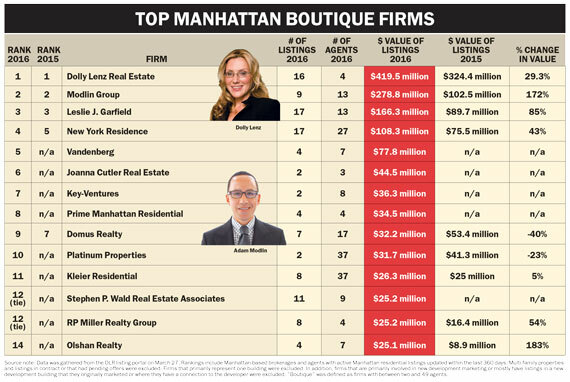 Joanna represents the most unique and spectacular real estate in Manhattan. Known for her integrity and candor, Joanna will not encourage deals until convinced that the fit is truly right for her client. She thrives upon the challenge of finding each client their ideal home, intimately knowing their needs, lifestyle and personality. Her laser-focused intensity enables her to get the attention of the most qualified and interested purchasers in the marketplace. She has an incredible enthusiam and devotion to her clients, and an extraordinary ability to negotiate and come up with creative solutions in order to execute any deal. Small wonder that she has such a fiercely loyal clientele. Joanna has an enormous client base in the entertainment industry. She can be found dining with Mariska Hargitay, Maria Bello, or Naomi Campbell, spending time with Carol Alt or Jennifer Aniston, as well as fund managers and real estate developers. After receiving a masters degree in psychology from University of Pennsylvania, Joanna went on to become a high-fashion model. With her sense of style, amazing taste, and intuitive take on human nature coupled with her strong background in psychology, becoming one of the most passionate, focused, prepared, determined, committed real estate brokers in the industry was a natural. Joanna has sold 50 Townhouses and Mansions. She sold 4-8 East 64th Street, a 50 ft wide Mansion, and was acknowledged for breaking a record for the sale of a 25 ft wide Mansion, 36 East 75th Street, which she sold for 35 Million. She sold 60 East 66th Street and 122 East 78th Street, a 36 ft wide Mansion, both personally owned. 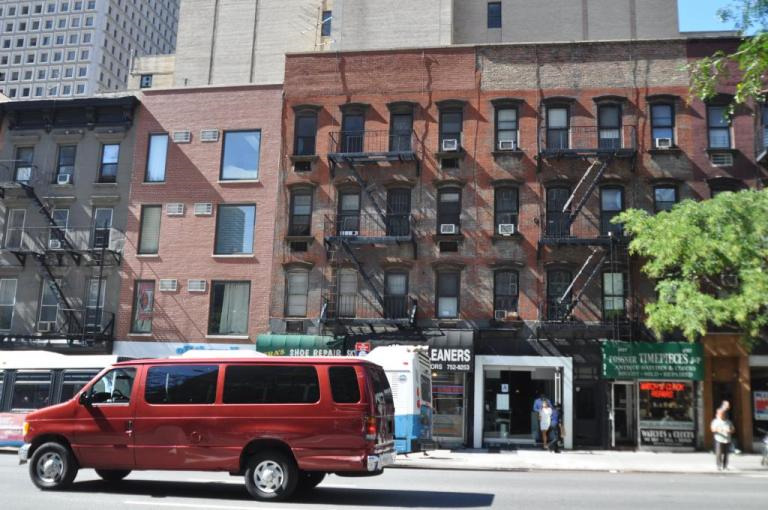 She represented the owner of six multi-family buildings and development sites in Midtown East and the West Village, and sold all of them in record breaking time. 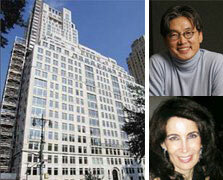 Joanna was the only Broker to purchase a half floor at 15 CPW, facing Central Park. She purchased apartment 1210 at The Plaza as her primary residence. For all of her investments, including a recently purchased half floor at 220 CPS, The Plaza is where she chose to live, and still remains fiercely loyal. She has sold 8 apartments at The Plaza, and has purchased apartments 503 and 706 as investments. Joanna pursues a wide variety of interests including pilates, film, travel and contemporary art when she is not involved in her all-consuming career. Residential real estate is primarily a home but also an important investment. Joanna is conservative in her approach to an appropiate purchase. She owns homes at One Beacon Court, The Plaza, 15 CPW as well as Trump International Hotel & Tower Chicago, and is in contract to purchase a half floor at 220 CPS. An appointment can be made with Joanna Cutler for an exclusive consultation on buying or selling real estate. Her telephone number is (212)838-0012. JOANNA CUTLER'S EXCLUSIVE LISTINGS CAN BE VIEWED BY CLICKING ON THE CURRENT LISTING PAGES. 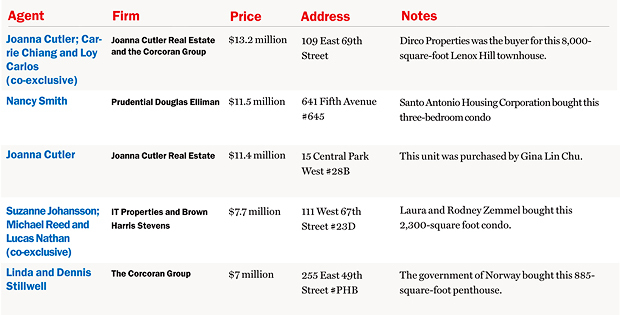 Footnotes: Data is for closed deals filed with the city this week through Thursday. The chart only includes sellers' brokers, because buyers' brokers' names are not available in city data or listings. The data does not include deals in contract. To obtain broker information, listing information was compared with sales records filed with the city. Only deals where an individual broker and address can be identified are included. As a result, private sales, listings where an address has not been provided and new development sales by a sales center are not included. Sources: Streeteasy.com and The Real Deal. It's New York Fashion Week, but models aren't the only ones with quick-changes on the Upper West Side. A preppy makeover is also likely in store for a two-bedroom, 28th-floor apartment at Robert A.M. Stern's 15 Central Park West, which just sold for $11.39 million to philanthropist Gina Lin Chu, wife of Nautica founder David Chu, according to deed filed today with the city. The seller of the 2,367-square-foot spread was another clothing mogul with a decidedly different style: Joseph Betesh, founder of hip-hop retailer Dr. Jay's. The urban fashion maven, and now, apartment flipper, paid just $5.7 million for the apartment in April 2008. The Chus actually already live at 15 Central Park West -- in a sixth-floor, 1,605-square-foot condo they bought for $2.99 million in August 2008. But it's their duplex penthouse at the former Mayfair Hotel that's drawn the most intrigue. The 7,700-square-foot condo hit the market in March for $32.8 million, placing it among the top 10 most expensive condo listings in the city at the time. It has since lost a little luster, undergoing two rounds of price cuts that brought it to its current asking price of $25.8 million, but garnered some star power when the Post reported earlier this summer that Sarah Jessica Parker and Matthew Broderick had been eyeing the place. The Chus were not immediately available for comment, nor was Joanna Cutler, of her eponymous brokerage, who had the listing for the new spread. Joanna Cutler represented both the buyer and the seller. The deal entered contract in May. Correction: This article misidentified the broker on the deal. The broker is Joanna Cutler.